What Causes the Appearance of Common Warts? It is a sad fact of life that warts and humans have been keeping close company for millennia. Many potions, lotions, and cures have been designed and applied, but still, the growths persist. Common warts are benign non-cancerous skin growths of the top layer of skin and mucous membranes. They are skin colored, rough to the touch, dome-shaped, and usually grow around the nails, on fingers or the back of hands. Like any other warts, the common variety are caused by human papillomavirus or HPV. There are over 100 strains that have been identified and 60 of them, possibly more, are identified to cause warts. Particular strains that most frequently infect people and lead to the development of common warts are human papillomavirus strains 1, 2, 4, 27 and 29. The human papillomavirus can be transferred where there is abnormal skin openings or skin breaks like wounds, scratches, cuts, abrasions, and breaks around fingernails that have been bitten, damaged or picked. Common warts can spread very quickly. They can spread either through direct skin contact or indirect contact. In the event that you touch a wart accidentally or intentionally, for whatever reasons, doctors advise that you wash your hands thoroughly as soon as possible. However, not all who get infected with HPV will grow warts later on because every person’s immune system reacts in a different manner. In contrast with the widely accepted notion, warts do not have roots and they only spread on the top layer of the skin or mucous membrane. In that sense, common warts on hands, feet and mucous membranes are definitely harmless and non-cancerous. Whenever you notice granular, tiny skin lumps that appear on your hands, palms, fingers, toes, feet, soles, eyelids, and lips you may have been infected with HPV. This is what will have caused these warts to grow. As mentioned earlier, it would take about two to six months for common warts to develop. Within that span of time, it can show tiny black spots, the same size of a pinhead and the color of the wart will likely be similar to your skin color. 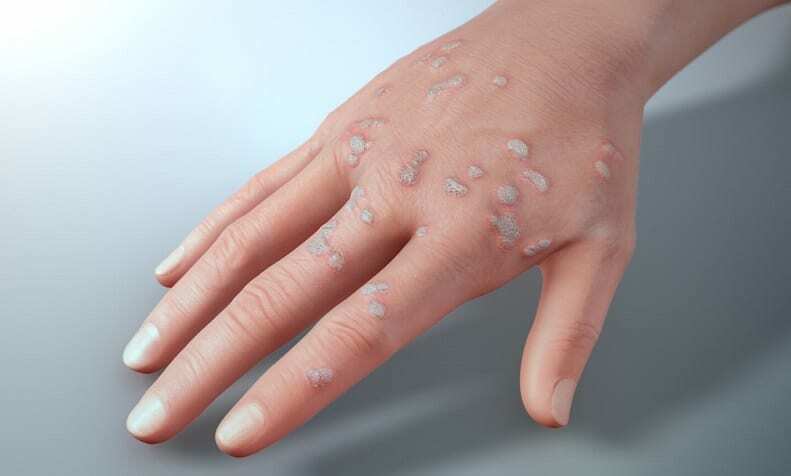 There are a few factors considered by scientists as to why some people are sensitively infected by warts while others never get infected. A few of these factors are the type of HPV strain and its strength, how strong the immune system of the person is and how healthy is the person who is exposed is. As mentioned, common warts normally grow on the feet and hands and they appear to be bulbous. Children and elderly are more prone to having common warts than others because one of the factors to consider is the strength of a person’s immune system response. The size of common warts can range from 1.5 millimeters, which is about the size of a pinhead, to 10 millimeters. In most cases, common warts normally do not have pain. However, there is an exception when the wart acquired develops under your foot which is particularly known as a plantar wart. These types of warts can be really painful because, instead of growing outwards, it grows inward instead due to constant pressure exerted when walking and standing. Common warts, in most cases, do not cause so much trouble. Aside from the problem caused by plantar warts, another case that can cause some sort of discomfort, which is pretty much rare, is Filiform warts or warts that grow on your eyelids or lips. Like any other wart treatments, remedies for common warts demand patience. Treatments and methods to remove common warts can last from several weeks to months. No one has ever found a way to remove warts overnight. Not even with the most expensive treatments for common warts. An option you can choose is to completely forget about it. Common warts will sooner or later come off by themselves. However, ignoring common warts may take several months to years. Your immune system needs to fight off the virus causing warts. For whatever reasons you may have, if you just can’t stand for these warts visible, then there are home remedies, over-the-counter ointments, and patches that you can use. Combining some of the known treatment methods for warts has proven to have an increased effectivity. If unsure with how to do it yourself, you can always visit your nearest dermatology clinic and have your warts frozen with liquid nitrogen (known as cryotherapy), have them electrocuted/boiled with electrolysis, or if you have the budget, you may also have your common warts treated with laser wart removal. One popular do-it-yourself method that people have used to remove warts is known as the duct tape method wherein you can eliminate them by placing a piece of duct tape over the common wart and leaving it for a week. You then remove the duct tape and scrub off the dead skin layer of the wart with a pumice stone, let it dry for 10-12 hours then place a new strip of duct tape. Repeat the process for approximately eight weeks and your wart will completely disappear according to some cases. For further information on the use of duct tapes for removing warts, please click here at https://warts.org/wart-removal/natural/duct-tape-method. Based on one of the studies with regards to the effectiveness of duct tape in removing warts, duct tape was found to be as effective as cryotherapy. Within four weeks of doing the treatment, 85% of warts already disappeared (Focht III D, Spicer C, Fairchok M. The Efficacy of Duct Tape vs. Cryotherapy in the Treatment of Verruca Vulgaris (the Common Wart). Archives of Pediatric and Adolescent Medicine 2002; 156:971-4). Nonetheless, current studies show that warts, in all probability, may recur with the use of the duct tape wart removal (Wenner R et al. Duct Tape for the Treatment of Common Warts in Adults. Archives of Dermatology 2007; 143:309-13). The lumps hinder you from performing normal daily activities. Whenever you notice a great number of common warts that are beginning to grow, and you are an adult. This shows that your immune system is not working properly. When the lumps are hurting. When you are unsure if the lumps are warts. You’ve already tried all sorts of methods to treat common warts and they haven’t disappeared, or they continue to grow and spread. you will normally see these common warts on hands, fingernails or on your feet. They come from HPV. Once you are infected with the virus, it will take approximately two to six months until the common warts are developed. Common warts or also termed as verruca vulgaris are granular tiny skin lumps. Common warts have been in a relationship with human beings for an awfully long time. A lot of lotions, methods, treatments, and cures were created to fight off these annoying lesions, but no one has been able to create the perfect formula to destroy it completely overnight. Even if it’s annoying and at times painful, there is nothing to worry about it because common warts are harmless and non-cancerous bumps on the outer layer of the skin and with proper immune support and over the counter home remedies, they will eventually go away.